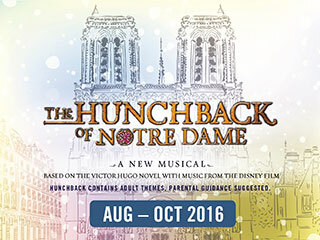 Th Hunchback of Notre Dame is starting this week at Tuacahn! Preview nights are a great way to see the show for a discounted price! There are four preview nights you can attend. Preview nights are like a regular show but they will stop if there are technical issues or other big problems that need to be fixed. Most of the time they are able to go through the entire performance without stopping. Another bonus about the preview nights is that they are cheaper tickets than regular performances. So do preview nights sound like something you'd be interested in? The preview nights are on July 29th, July 30th, August 1st and August 3rd. You can get 50% off preview night tickets by using promo code HUNCHBACK50. The Hunchback of Notre Dame is based on the novel by Victor Hugo and the Disney movie. Set in the late middle ages and tells the story of Quasimodo and Esmeralda.